recover lost deleted formatted bkf file from EXFAT FAT32 NTFS hard drive system or external drive, usb drive. BKF file recovery - deleted BKF file recovery,Best free software for recovering bkf after format hard drive,usb,external,flash,pen,sd card. Use "Undelete" mode to recover deleted bkf files from hard drive. Use "Unformat" mode to restore lost bkf files after format hard disk. Use "Recover partition" mode to recover bkf if partitions changed or damaged or deleted. Use "Full Scan" mode to retrieve lost bkf files if hard disk partitions show as "raw" or recover deleted bkf files which can not be found with "undelete" and "unformat" and "recover partition",restore bkf files from raw partition,rescue bkf files of partitons which are not NTFS,nor exfat,nor fat32. 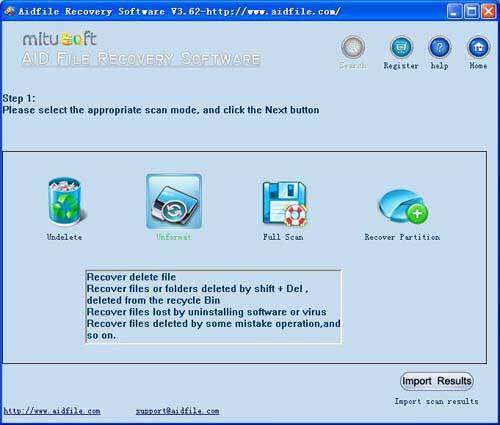 Aidfile recovery software professional edition's "full Scan" support deep and full scan lost data from partition , hard drive, usb. Aidfile data recovery software is very useful recovery tool for all users to recover formatted BKF files or open BKF . Aidfile data recovery software can recover all files-folders from formatted BKF created with NTBACKUP.exe, Veritas Backup or any backup utility. support FAT32,EXFAT and NTFS file system,or other file system as raw. support sd card,hard drive,flash drive,usb drive,cf card and so on.